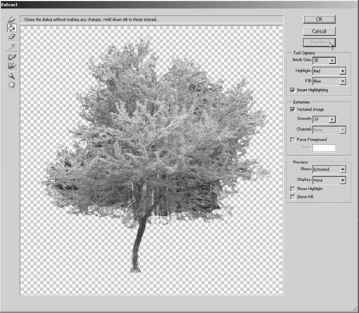 1 Layers allow you to edit different parts of an image as discrete objects. 2 The eye icon (») to the far left of the layer name in the Layers palette indicates that a layer is visible. You can hide or show a layer by clicking this icon. 3 You can make artwork on one layer appear in front of artwork on another layer by dragging layers up or down the stacking order in the Layers palette or by using the Layer > Arrange > commands: Bring to Front, Bring Forward, Send to Back, and Send Backward. Remember that you cannot change the layer position of a Background layer. 4 You can link the layers you want to adjust by selecting one of the layers in the Layers palette, and then clicking the square box to the left of the Layer name of the layer to which you want to link it. Once linked, both layers can be moved, rotated, and resized together. 5 You can flatten the image, which merges all the layers onto a single background. 6 You designate the language dictionaries in the Character palette. You can set different language dictionaries to check different parts of the text in an image file, either by layer or by individual words. To designate a language dictionary for individual words on a text layer, use the type tool to select (highlight) those words, and then select the dictionary in the Character palette. Each word can be associated with only one language dictionary, but you can use as many different dictionaries as you need to check different words in your Photoshop files.